In this building, we learned that the art of driving an SUV on the Beltway has not changed noticeably since colonial times. For this New Years weekend, we took a trip down to Colonial Williamsburg which was a very good balance of traveling between "way too much time spent in the car" and "let's get Boston Market for dinner tonight". The temperature stayed in the 60s the whole time (and obviously all of the snow had melted by the time we arrived). We shacked up at the Magnolia Manor, one of seven thousand Bed and Breakfasts within walking distance of William & Mary, notable for its gigantic whirlpool bath tubs and staff that walked a comfortable path of being accessible without hanging around all of the time. The three basic food groups for each morning's breakfast were potatoes, eggs, and bacon, in various permutations. This is a definite "win" in my book of successful breakfasts. After a dinner of five shared sangrias and a prime rib cooked so rare that it was linked in a blue font, we participated in the Williamsburg "First Night" activities: a set of community musical performances at various venues around town. First up was an Native American storyteller, followed by a pleasant community swing band with more verve than talent. We opened the new year by watching the fireworks display from the comfort of our room, since they were launched just two blocks away from our window. On Saturday, we wandered through all of the parts of Colonial Williamsburg that did NOT require us to pay the ridiculous $36 admission fee and had giant, greasy sandwiches at Paul's Deli. We saw deer gallivanting in the fields around the Governor's Palace by moonlight, and ate all of the samples in the Peanut Shop. 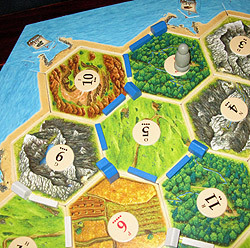 Finally, we returned to our swank two-room suite at the Manor and played multiple two-player variants of Settlers of Catan, where I got lots of sheep. How did your 2010 turn out? Did 4 bosses shirk snow duty and buy beer? 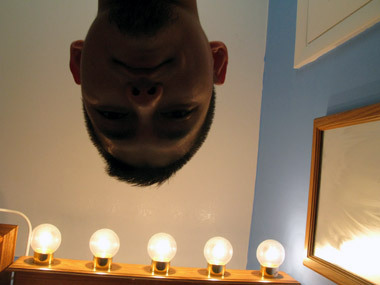 I've finally uploaded the remaining photos from 2010, and started a new album for 2011 on the Photos page. This year, I resolve to be more proactive about photography by implanting a small camera (with zoom lens) in each shoulder, and taking pictures every hour, which will be automatically uploaded into Picasa. If that doesn't work out, I'll just take pictures whenever I happen to have my camera with me and the batteries are still good. I bought this external drive to do automated backups of the various machines on my home network, and it performed just fine for a while. In the immediate aftermath of the motherboard failure on my main desktop, my first action was to disconnect the external drive and send it to the Presidential bunker for safekeeping. I removed the USB cable for the first time, and the connector popped right off, rendering it useless. Luckily, I was able to MacGyver it apart and hook it up as an internal drive to save the data, but the soldering craftsmanship was obviously subpar and I've since read of many other people having this problem. This CD was surprise hit -- I asked for it for Christmas, simply to get a recording of "The Day I Died", and ended up with a CD full of catchy hooks, British rapping, and dance beats. I can count at least 5 songs worth burning like "Doctor Doctor" and "Astronaut", when the usual CD I buy has a record of 2-3 hits. Despite having played World of Warcraft for years, I somehow missed the release of this web show about roleplaying gamers and their antics after meeting in real life. I don't know how funny it will be if you know zilch about online gaming, but if you've got the least bit of experience, you'll probably love this show. Although episodes are available online, the DVD version bundles the first two seasons (about 2 hours of airtime) with fewer credits sequences and some fun extras. ♠ Happy New Year! We've got one full week down in 2011, but there's still no sign of flying cars or people on Mars. Obviously, pop culture movies are not a good foreteller of the future. Thinking back to 1997, I don't believe that Skynet was anywhere near sentient, although I may have seen a few Eliza clones in one of the chatrooms I used to frequent. 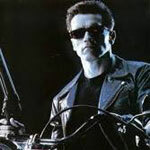 ♠ Since I knew the original Terminator 2 movie by heart, it was a little jarring to watch to special edition with about 20 minutes of extra footage recently. For the most part, the additions actually improved the final picture, although the beginning dragged a little too much. ♠ They also cut out a whole sequence which explained why this particular Terminator was able to learn new concepts -- it seems to me like that really should have stayed in the original movie, but maybe James Cameron didn't want to give away all of his secrets to the people who would eventually found the Roomba corporation. ♠ Now that the movie industry has made every possible sequel and used up all of the childrens' books (other that The Chronicles of Prydain starring Michael Gambon as Dallben), perhaps its time to start reimagining the old sci-fi movies with our current understandings of technology. For example, we probably won't be advanced enough to send a liquid metal Terminator back in time, so the villain would probably more closely resemble a really pissed off Zhu Zhu hamster. ♠ I had read The Chronicles of Prydain multiple times before I even left the third grade. I remember a girl in a sixth grade Talented and Gifted class complaining about "The High King" being too hard to read because "there are too many thee's and thou's in it!" I also owned the Sierra On-line version of The Black Cauldron for PC, and died many times on the obligatory Sierra cliff-climbing sequence. ♠ I think every Sierra game had at least one section where you had to ratchet game speed down to Slowest while you navigated a narrow path up or down a mountain. One pixel too far would send you tumbling to your death, but thankfully there were only 320x200 pixels to worry about. ♠ The most egregious offender in the "fall and die" approach to game challenge was King's Quest IV: Perils of Rosella. That helpless hussy could fall off a SINGLE STEP onto the grass and your game would be over. Wouldn't game designer, Roberta Williams, have been an apt candidate to dispel the myth that girls are fragile? Come on, Roberta! ♠ Plans for the weekend include a visit with Paige and Matt this evening before they wend their way back to Russia or Houston or wherever they camp now. 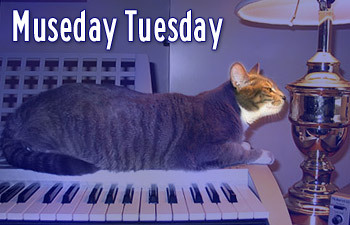 Tomorrow, I'm going to fix a couple leaky toilets in the house (because I've had it up to here with poop on the floor?) and then we're heading to the post-Christmas party of i-less Page. We have no plans for Sunday yet, so maybe we'll plow through some of the many unwatched movies that seem to be on our shelves these days. Finished the final season of 24. Gave 3 DS games I never play anymore to Paige, so she can weather the rest of winter in Russia. Left food out in the snow for a stray cat. Purchased 6 pounds of ground beef from Costco, and packaged it into 12 individual flat bags for ease of use and thawing. Watched Inception and found it surprisingly unannoying. Fixed a sticky toilet tank that wasn't refilling after flushes. Tried to make steak, but found that I was out of propane. Stove steaks stink. Came in second in a Christmas Trivia contest at a holiday party. Replaced a dirty kitchen water filter. Almost fixed a leaky toilet tank but more parts are required. Leveled the new priest to 27 with Anna and Ben. Looted a Poison Vial Ring in Mt. Hyjal and sold it for 450 gold. Had Shells and Cheese for dinner, and discovered that the commentary track on Dr. Horrible's Sing-Along Blog is almost better than the web show itself. Took a bath and started a new Kindle book on serial killers. Thickset: (adj.) Having a solid, stocky form or body; stout. This tune is written for a couple recorders backed by an organ and harpsichord, and supported by the stodgy mud of baritone saxophones. It's in A Flat Minor because that's what you'd get if a thickset person fell down a mineshaft. As a new feature for Museday 2011, you can now suggest your favourite adjectives in the comments section. On some occasions when the random word generator just isn't making the cut, I may use your word to inspire! You will even get 5% of the royalties for the thirty-second excerpt, which currently works out to $0 per year. 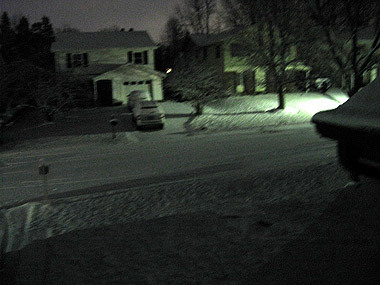 6:03 AM: Making the executive decision to call it a Snow Day. 6:37 AM: Learning that my new computer has been delayed by snowstorms in the South. 8:33 AM: A late shower after a morning's work. 9:53 AM: Hiring a local to shovel my driveway while I work. 11:02 AM: On a conference call. 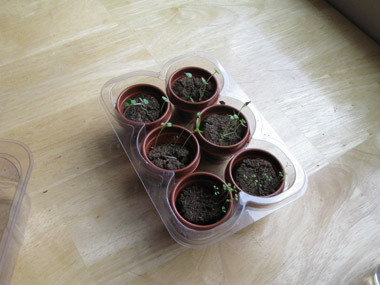 12:53 PM: Checking on our herb garden after lunch, to see if the parsley is ready for devouring. It was not. 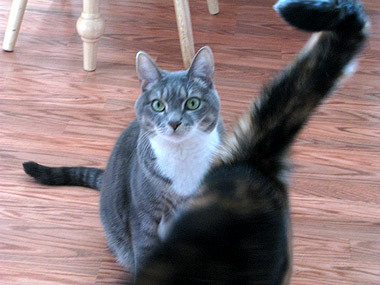 2:42 PM: Cats, anxious for lunch. 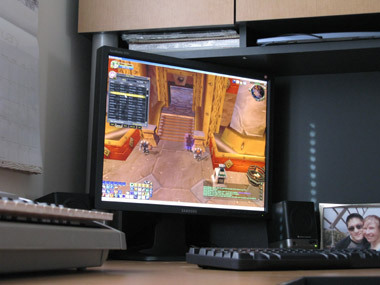 4:46 PM: Tidying up the Guild Bank in World of Warcraft. 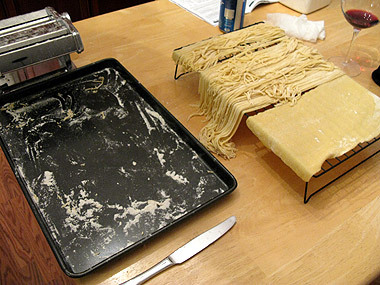 6:48 PM: To offset the atrocious mundanity of a stay-at-home day, I decided to make homemade pasta for dinner, finally using one of our wedding gifts for the first time. 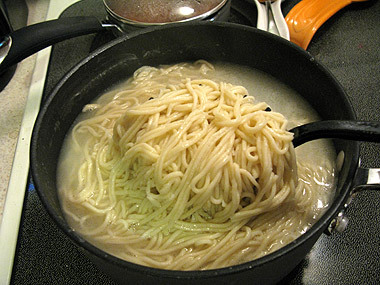 7:24 PM: Making pasta is fun. 8:00 PM: Spaghetti with a tomato, basil, beef sauce! Today was also "no flash" day. 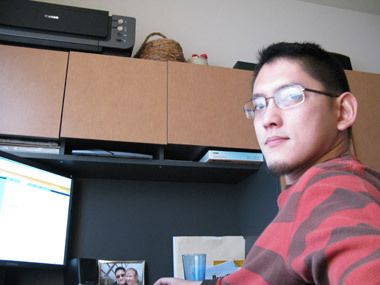 See more 12 of 12ers at Chad's site! I was initially biased against this movie, based on the ridiculous trailers featuring Leo proclaiming, "I can get inside your mind!" while obligatory CGI was obligatory. The fact that the trailer premiered during the awful LOST finale didn't help its case. The movie adheres to the Moulin Rouge school of cinematography, where the first fifteen minutes are full of quick cuts and nonsensical actions before they calm the eff down and start explaining at a slower pace. At the end of the movie, I was pleasantly surprised with how coherent and followable everything was. This is no Memento -- although the subject matter requires some brain power, I don't feel the need to go back and rewatch it again just to pick up on missed threads, and I was satisfied with the story told and the ending. Definitely worth a viewing. 24 was always the go-to show for mindless entertainment back when Anna lived here, but we were never able to get through the illogical sixth season together. I finally picked it back up last year, greatly enjoyed the seventh season, and finished the final season just last weekend. There are no new plot devices here, and it's mainly a retread of "ideas that worked" from older seasons, but it's all well-done enough to keep you involved. I'd rank this as good as the 4th and 5th seasons, but not as good as the 7th. In addition, the finale ends "as it should" without any hints of metaverses, purgatory, or dead wives. I got this CD for Christmas after liking the single, No One Knows, but unfortunately, that single is the most relatable song on the album. The rest veers heavily towards death metal, featuring heavily distorted guitars mirroring bass lines over repetitive chromatic step lines. They sound like Muse, with more shouting and testosterone and less harmony, and this isn't a good thing. There's also an overuse of useless interludes between songs, as if the album is being played by a radio DJ. I want music, not segues! My oft-delayed new computer is finally arriving sometime today, so I'm in the process of backing up the old one to make a clean break. I'll be back on Tuesday! 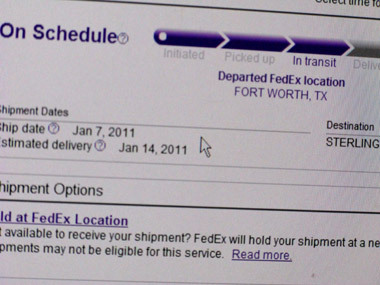 It takes FedEx 8 hours to get from Alexandria to Sterling. HP may not moneygrub for $15 Recovery CDs like Dell, but that's just because they don't bundle ANY CDs. The wiring job in HP cases is very neat. Too bad I'm going to rip them all out to install a new power supply, a second hard drive, and a graphics card. If the power supply company would just put the power cord in the standard location, I wouldn't have to bend part of the computer frame to install it. I ordered a graphics card and ended up with some sort of Harley-Davidson hydrocraft. 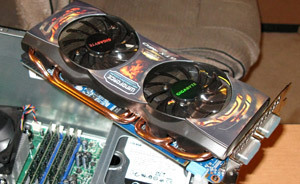 The clicking sound in the graphics card fan came from a bundle of wires placed right next to the fan blade. That wouldn't make anything bad happen in a month's time. Poking it with a screwdriver fixes it. Starts up perfectly on the first try! Turning off User Account Control notifications, NOW. On the plus side, you can now repartition a hard drive without reinstalling Windows. On the minus side, it takes three hours to uninstall the bundled crap that HP throws in. Who needs four separate e-reader trial applications? Windows 7 seems to have removed the ability to change MIDI providers. 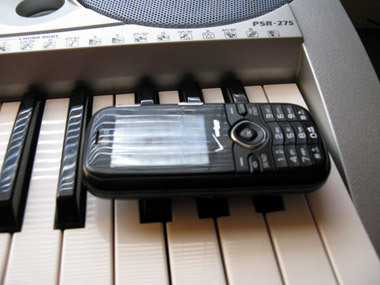 I had to download a third-party app to use my Roland Sound Canvas. It took twelve hours to restore all of my programs and set up the second internal hard drive, formerly known as an external drive, to periodically create mirror images of all the computers in the house. Finale 2006 doesn't work in Windows 7. Time to waste $170 on an upgrade with no new features that I actually use. My 1998 Altec Lansing speakers are finally crapping out. Time to blow another $100 on Logitech replacements. 64-bit versus 32-bit program differences are annoying to troubleshoot. This flat profile HP keyboard makes it impossible to play Warsong Gulch and know which keys your fingers are on. Back to the Dell. I can now play games with nearly max graphics settings. 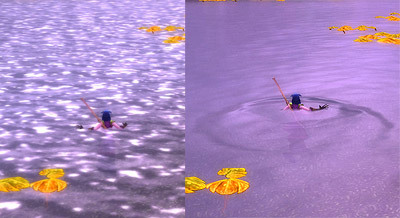 The Warcraft water ripples and reflections are really well done. The problem with going to work at 6 AM is that the server never blows up until after 6 PM. I haven't left the office yet, so my insightful, humorous, possibly scatalogical review of the $160 toaster oven I got for Christmas will have to wait until next week. How much would you take not to fly? 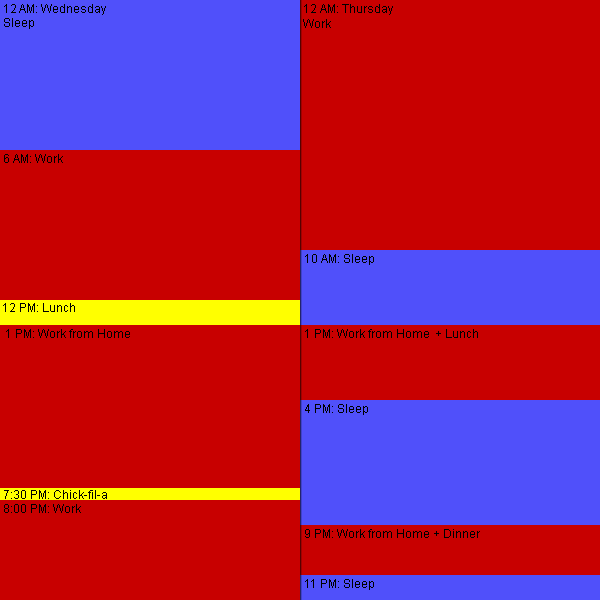 The chart below shows a visual representation of my Wednesday and Thursday. It is safe for the colourblind, but not the indolent. Following the red attack from last Wednesday and Thursday, I stayed home on Friday and tried to cut back on my hours a bit, which was only partly successful. In between left jabs of work, I tried to install Finale 2011, and watched it freeze up the entire computer, only half surprised. 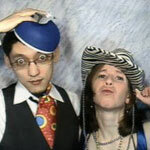 On Friday evening, Emily and Other Brian, who are now engaged, came over for a dinner of aromatic stuffed peppers. Saturday was a deservedly lazy day -- I watched the third season of The Guild, and looked at a smorgasbord of new kitchen cabinet styles, in preparation for an upcoming overhaul of this room to get rid of the apple-themed tiles. Kelley and Kathy, and Jason and Rosie came over in the evening (followed by the later arrival of Annie), and we discussed how much taxpayer money is wasted on Kelley's new job with the Army band. Rosie's son only fell down the stair once. We had homemade blueberry pancakes for breakfast on Sunday, and I did very little for the remainder of the day, other than play some Warcraft and try (unsuccessfully) to get my microphone working under Windows 7, which I mostly hate right now. If a Windows XP 64-bit edition ever comes out, I'll be first in line. This week looks like a pretty busy one, but I'm hoping that by frontloading the week and getting a lot done today, I'll have more time later in the week to keep my website commitments, including how to play Uno with Garbage Pail Kids, and why Black and Decker toaster ovens are awful. 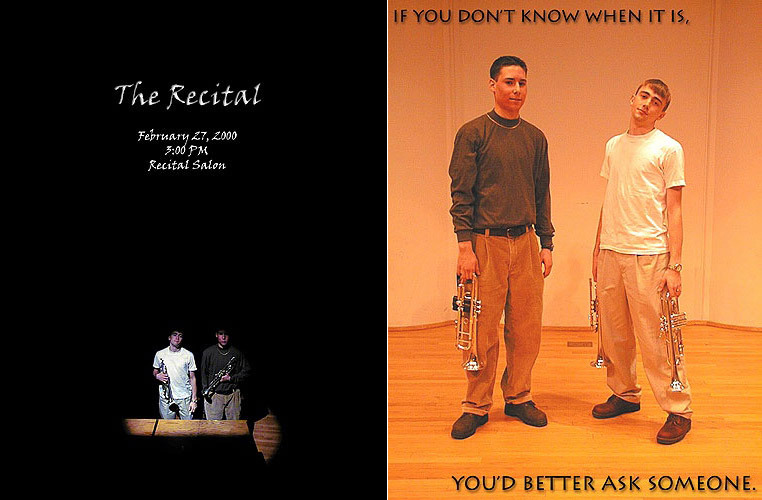 I'm still having issues getting Finale 2011 to work under Windows 7, so the sodium substitute for today's Museday Tuesday feature is this complete set of recital posters from Kelley and Shac's Sophomore Trumpet Recital. 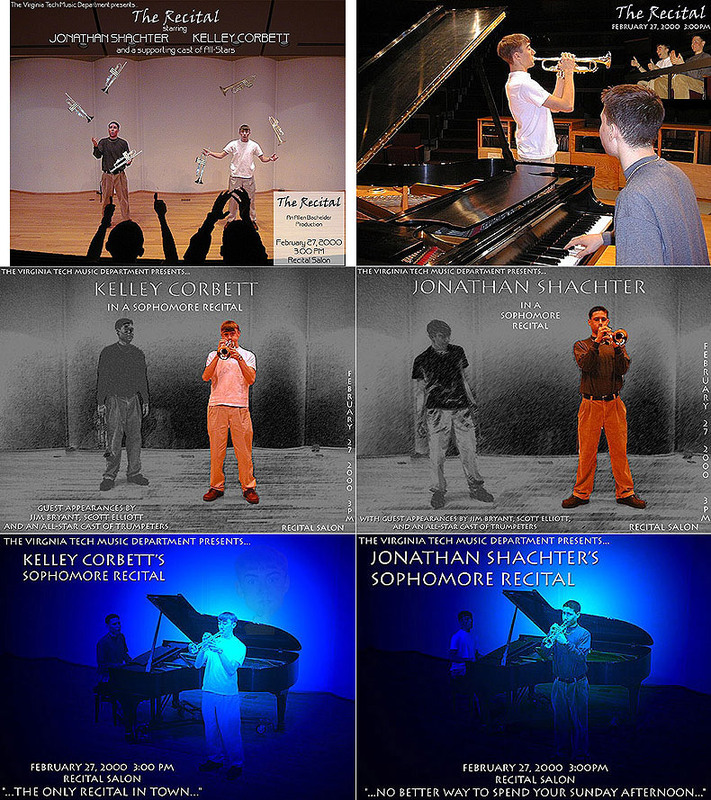 These posters were made in the early days of my self-taught Photoshopping, which meant that the bulk of the effects were the result of eighty abused filters and painstaking cut-outs of layers in the pre-carpal tunnel days before I knew what a Mask was. Next on the drawing board? A similar app that allows women to report sightings of handsome men. 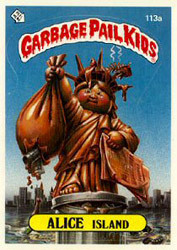 Back in the late 80s (the ladies), one of several passing fads were the Garbage Pail Kids trading cards. 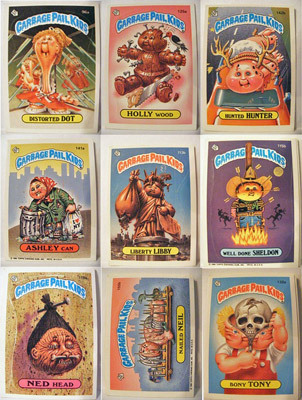 These cards were a grotesque parody of the Cabbage Patch Kids, and came bundled in 5-packs with a stick of gum. The characters on the cards had punniful names, and to increase the need to buy additional cards, every picture was printed with one of two possible names. Collecting trading cards is annoying, except when your parents buy everything in bulk quantities. I was never able to complete the 100 card set for The Dark Crystal, since we only purchased them in 7-Elevens, but when it came to Garbage Pail Kids, we got twenty packs in a single afternoon and immediately ate all of the gum. Of course, the problem with circumventing the society rules on collectibles, is that there's nothing to look forward to when you have a complete set, and you end up with a ton of multiples on the least rare of the cards. The obvious solution, is to invent some sort of alternate game to play with the cards instead. In our case, it was UNO. The rules for GPK UNO were about as simple as you might expect for a game invented by nine-year-olds. The color of the background behind the character names became the UNO suit and playing a card with the same picture but an alternate name allowed you to Skip and Reverse. The horizontally-oriented cards became the Draw Twos and Draw Fours, with Tongue-Tied Tim and his counterpart as the scariest cards in the deck. The games worked out surprisingly well, considering that we had a deck of 200 random cards and no professional background in game making. No doubt, this paved the way for my future game ideas of Clue and Island of the Blue Dolphins. What sort of games did you invent as a child? There are no spoilers in these reviews, except that the restaurant was lame. I never thought I would become a toaster oven snob but after a succession of cheap Black and Decker ovens with an assortment of issues (stopped working after three months, had no completion bell, turned the left bagel black and refroze the right bagel) I asked for this classy oven for Christmas. Using and programming it are iPod-simple, and every single bagel and toast entree I've made has come out perfectly, even in the often-failing case where you toast something else while the oven is still warm. Besides breaded objects, we've also made a chocolate cake, a small pizza, quesadillas, bean dip, and other delicious goodies. As a bonus, this toaster oven came out at the top of the Consumer Reports ratings after we bought it. 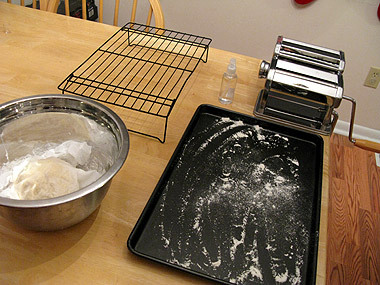 If you use a toaster oven with any regularity, give it a look. I believe that this was Gomez's first CD from the late nineties, and it also comes with a bonus CD filled with BBC Live Studio recordings. The actual album is pretty bland, with no big highs, and ends with one of those seven minute vamp songs that you want to be over after three. The BBC recordings are more interesting, but really only for fans. This is another serial killer book by the Mindhunter guy, so it's immediately bogged down by the introductory biographical filler that I've memorized by now. However, because this book focuses on a single killer, there's a surprisingly deep analysis of the crimes, the perpetrator, and the post-capture follow-up. In addition, this true-story account essentially IS the plot for the fourth season of Dexter, so I'm glad I didn't read it until afterwards. Negative Yelp reviews of The Counter have kept us away in the past, but we decided to give it a try after receiving a free burger coupon in the mail. The service was overly attentive at first, but then went downhill after that. Our fries came out immediately and were delicious. The burgers were "okay" and came out a full forty minutes after we had ordered. No one is hungry after forty minutes of fries, and our waiter claimed that "they had run out of meat in the kitchen". This seems like a bad state to be in during normal dinner hours. He also tried to convince me that Stouts are supposed to be golden yellow and taste like wheat beer after he messed up my second beer order. I would not even have needed a second beer order if the burgers had come out on normal human schedules. Bottom line: This is a decent, slightly undercooked burger if you can get it for $6 and home-delivered. It's not worth your time if you have to eat it in the restaurant and pay $10. Note: The Counter does not deliver. I have reduced my work hours per day from a high of 17 down to 6 today. Troubleshooting Finale 2011 is really annoying when it completely freezes the computer to the point where you have to power it down to continue. 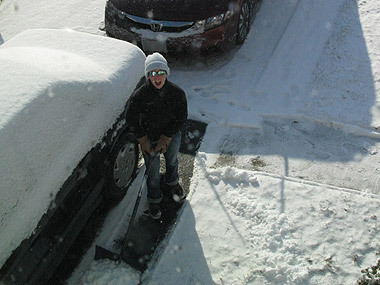 We got 8 inches of snow, but it was all easily shovelable. Fairfax County snow plows are much better at their jobs than Loudoun County snow plows. My new Warcraft character is now level 42, but has done every single available quest in the level 30 and below zones. Tonight is Warcraft Night with the Ahlbins. Jack Wilmer is a year older today. Happy Birthday! Friday night was Warcraft night with the Ahlbins, as the respective sects of that family locked their respective kids up in various cupboards so we could all do some dungeon runs together. 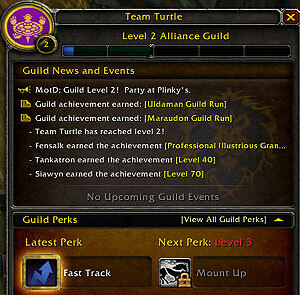 The Guild reached Level 2 over the weekend and got the 5% experience bonus, which means that you can now get from level 1 to 60 in about 4.5 minutes. On Saturday, we watched The Social Network, which shall hereafter be referred to as The Only Movie Starring Jesse Eisenberg That Hasn't Annoyed The Piss Out Of Me. 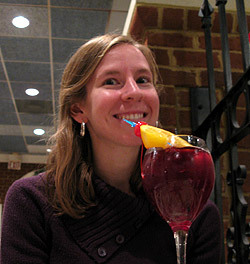 This was followed with dinner and drinks at Mylo's in McLean, a restaurant with a mild Greek persuasion. I got a little work in on Sunday morning, and then we met Rebecca's parents for lunch outside the crafts fair at the Dulles Expo Center. We followed that up with an impromptu game and pizza night with Kathy and Chris who were temporarily evicted from their town house while prospective buyers went through their drawers and stole their copper piping. In the evening, we finished another movie and then broke into the chocolate pie from last weekend's aborted poker game. None of those clowns deserved chocolate pie anyhow.